The photo shows volunteer Laura (right) supporting Shirley whose sister Liz is her full time carer. By giving just a couple of hours every fortnight, Laura gives Liz the chance to take a break from her caring commitments. 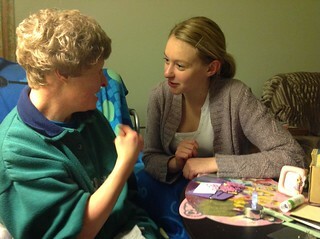 Together Laura and Shirley enjoy doing crafts together and chatting about their lives. Laura has become a very important part of Shirley's life.